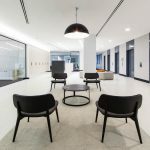 IA Design were engaged by one of Australia’s leading fit-out, refurbishment and construction firms, Renascent, to design and construct a new fit-out for the Perth office. A contemporary industrial office environment that communicates the Renascent brand identity. The brief sought an office environment that reflected the Renascent brand identity and communicated the company culture to employees and clients. The space features polished concrete floors, warm timbers and exposed ceilings to achieve the desired contemporary industrial feel. Subtle details in wooden feature panels successfully add depth to the environment, and the careful placement of light creates a bright welcoming atmosphere that contrasts from the dark lobby. The exposed ceilings give the illusion of high ceilings, airing the space and making it feel more expansive. The company colour palette of green and black was incorporated into the design from the reception area through to the workstations and breakout areas to further enhance the brand identity. The timeframe for this project was tight, and IA Design worked alongside the project managers from Primewest to achieve a successful fit-out. The end result was an open and welcoming space that showcased the Renascent brand identity in look and feel.